In the dynamics of history and the variables which govern the course of political sociology, historians do not make history. They only record its course and describe the forces and narrate the events, which are a reality that the historians cannot distort or deny. There is a method in all historical processes. And there is a method in all political development. For Hitler, the invasion of Russia was a historical necessity. Nazism was an ideology and Germany was an ideological state. So were Italy and Japan. Japan also struck Pearl Harbor out of a historical necessity. That they would be defeated is a matter of the course, history of the Second World War took. Historical facts cannot be manipulated. There was a time, a century before the Second World War, which ushered in the worldwide movement for decolonization, when the flag bearers of the Concert of European Imperialist Powers, manipulated history to serve their power interests. The British called India a geographical expression. So did the Muslim League. Both sought to bat for the perpetuation of the British Empire in India. They realized deep inside them, that India was a nation, the expression of a six-thousand year old civilisational grid, an incredible continuity of history and a stunning expanse of civilisational frontiers, when they faced India in revolt in 1942, the Naval Mutiny of 1946, and the dogged resistance the State Army of Jammu and Kashmir offered to the invading forces of Pakistan for five days, till the Indian Army arrived in Srinagar. History is relentless. It doesn’t forgive. It doesn’t forget. Political Commentator A G Noorani and many like him in India have rationalized Muslim separatist movement in India of which the Muslim separatist movement of Jammu and Kashmir has been a part. Jinnah agreed with the Congress leaders, till the Congress leaders professed faith in Indian destiny within the British Empire. Why should the Muslim League have taken birth in 1906, when the Swaraj and Swadeshi resolution of the Indian National Congress was adopted the same year? Why did Sir Mohammad Iqbal, in his presidential address to the Muslim League Session at Allahabad in 1930 call for a Muslim confederacy in the North-West, North-East, the north and south of India, after the Indian National Congress adopted the Purna Swaraj Resolution in early 1930? Why did Jinnah threaten Gandhi with non-cooperate with the Congress, if the Congress extended its movement to the princely States and virtually compelled the latter to exclude the States peoples’ movements from the national movement of India, a course the Congress adopted, which brought it to the brink of disaster in 1947? Why should the Muslim League have adopted the Lahore Resolution for Pakistan in 1940 when the British were fighting with their back to the wall? Had the Muslim League realized that the end of British Empire in India had come? Jinnah was no votary of the Indian freedom from the British rule, nor did he visualize a united India. Instead when he insisted upon the lapse of the Paramountcy, he envisioned Pakistan, spread across the whole of India, with its mainland constituted of the Muslim majority areas of the British India in the north-east and north-west and pockets of its territory constituted of the Muslim majority States and the Muslim ruled States, interspersed among the provinces and the acceding States of the Indian Dominion. Noorani, the author of the two volumes of Kashmir Dispute, and many like him who masquerade as experts on Jammu and Kashmir have perhaps been never aware of the fact that Jammu and Kashmir was geographically a part of the northern India and not the North West of India. It formed the central spur of the frontier of India in the north, which is crucially important for the unity of India and the security of its entire northern frontier. Only a small part of the borders of Jammu and Kashmir were contiguous to the borders of Pakistan in the south and north-west. A larger part of the border of the State stretched along the borders of Afghanistan, mainly the Wakhan Valley, Chinese Sinkiang in the north-east and the Tibet in the east, with a long border contiguous with East Punjab in the south and the Punjab Hill States in the south-east. The much maligned Radcliff Award, did not do anything wrong in its Boundary Award. Sir Radcliff was not a British politician and he, contrary to the fond hopes of the Muslim League leaders, that he would oblige them on the biding of the British, at home and in India, did not do so. Pathankot the largest Tehsil of the Gurdaspur District was predominantly Hindu and could by no stretch of mind be included in the West Punjab. Contrary to the figures quoted by the author in his book, the Gurdaspur District had a minimal 0.8 per cent Muslim majority. The Boundary Commission did not follow District boundaries as the basis of the demarcation of the dividing line between the West Punjab and the East Punjab. Most of the experts in India including Noorani, who have sought to influence the discourse on Jammu and Kashmir and give it a dangerous direction, have been completely ignorant of the fact that besides the Jhelum valley road connecting Srinagar with Rawalpindi, a railway link connected Jammu with Sialkot and a tarmac road ran along the railway line, connecting Sialkot with Jammu. These experts, if their writings on Jammu and Kashmir are an indicator, do not seem to be aware of the fact that a cart-road, which was improvised by the ruler of the State, stretched between Jammu and Madhopur in Pathankot, over which transport moved without any difficulty, taking few hours to travel from Jammu to Madhopur. The author of ‘Kashmir Dispute’ does not accept and in fact takes a reverse position on the basic fact that neither the partition of India nor the lapse of the Paramountcy created a prior right for the Muslims of the State of Jammu and Kashmir to opt for an alternative to the accession to India, independence or accession to Pakistan. There are many in India who have been making assertive reference to the intention of Hari Singh to assume independence. These assertions are a total surmise and a travesty of history. Mountbatten flew to Srinagar in the third week of June, not more than three weeks after the 3 June Declaration of 1947, and shook the Maharaja out of his wits by tendering him the advice to come to terms with Pakistan. Hari Singh used stratagem to send the Crown Representative back to the Indian capital, empty handed. Accession to Pakistan was the last act he was prepared to perform. Hari Singh was not the man to have misunderstood Mountbatten, who warned him against any attempt to assume independence. In fact there is not the slightest of hints or pronouncements of Hari Singh on record to suggest that Hari Singh intended to assume independence. Four personal emissaries of Jinnah, met Hari Singh secretly, and to everyone he told that he would take a decision by himself and his decision would keep in view the interests of his people. Ram Chand Kak, a devout confident of Hari Singh, acted as his interface, with the Muslim League and his strategy worked to save the State from being plunged into a civil war during the crucial months intervening between the 3 June Declaration and the date of the transfer of power. In his controversial book, Noorani has conveniently omitted to refer to and discuss the implications of the proclamation of a “Provisional Government of Azad Kashmir” by the Muslim Conference leaders and cadres at Tradkhel in Mirpur on 28 August 1947, only thirteen days after the transfer of power in India. After the proclamation of the “Provisional Government of Azad Kashmir”, anti-Hindu riots spread across the Muslim majority districts of Jammu province bordering Pakistan. Facts of History cannot be bent to rationalize political events or influence their course. The Indian partition was foisted on the people of India by the Muslim League with the support of the British. The opinion of the people of India was not elicited on the partition of the country. Had the partition been referred to them, they would have rejected it and Pakistan would have never come into existence. The lapse of Paramountcy was also foisted on the people of the States, and when the Congress leaders beseeched the Muslim League leaders and the British to seek the opinion of the people of the princely States about the right to determine their future, Jinnah as well as Mountbatten did not listen to the Congress entreaties. Had the people of the States been accorded the right of determining their future the crisis which overtook Junagadh, the war in Hyderabad and Jammu and Kashmir would have never taken place. In Jammu and Kashmir, the Hindus, Sikhs and the Buddhists constituted nearly twenty eight percent of the population of the State at that time while the Kashmiri speaking Muslims comprised two thirds of the population of the State. The Kashmiri-speaking Muslims were dead set to evade accession to Pakistan, because they had opposed the Muslim League struggle for Pakistan and they knew that dreams of their freedom would be scuttled with the ascendance of the Muslim Conference, supported by the non-Kashmiri speaking Muslims of the Jammu province, to power in the State, if it acceded to Pakistan. It is a misnomer that the accession of the State to India was brought about with the support of the Muslims alone. In fact it was because of the Hindus, Sikhs and Buddhists along with the Kashmiri-speaking Muslims that the accession of the State to India was brought about. In the resistance against the invasion of the State by Pakistan, the Hindus and Sikhs formed the frontline of defence against it in the provinces of Jammu and Kashmir and the Buddhists in the Frontier Division of Ladhakh. In Ladhakh, the Buddhists kept the invaders at bay under the leadership of the legendary soldiers Captain Pirthi Chand and Captain Thapa. The left flanks of the National Conference largely constituted of the Hindus of Kashmir amongst whom were ideologues of National Conference and veteran fighters of freedom in Jammu and Kashmir. Niranjan Nath Raina Saraf, Pran Nath Jalali and Omkar Nath Trisal, defended Srinagar. The National Conference rank and file brought the rear of the resistance. Nearly forty thousand Hindus, Sikhs and Buddhists were killed in the invasion of the State. More than ten thousand of Hindu, Sikh and Buddhist women were abducted by the invading hordes and those who escaped death, were driven out of the territories that the invaders overran. The refugees of the territories occupied by Pakistan, Hindus and Sikhs, a million people, live in Jammu on the Indian side of the Line of Actual Control, still awaiting rehabilitation. The premise that the Kashmir dispute revolves round the freedom of the Muslims living in the part of the State on the Indian side of Line of Control, is only the half truth of the Kashmir dispute. The whole truth is that the Kashmir dispute revolves round the freedom of the Hindus, Sikhs and the Buddhists of the State who constitute four million of the ten million population of the state, easily comparable with the six million of the Muslims who live on the same side. The dispute also revolves round the future of nearly two million of the Hindu and Sikh refugees, who form nearly half of the population of the Hindus, Sikhs, and Buddhists of the State. Among them are more than a million refugees from the territories occupied by Pakistan, half a million of Hindus of Kashmir-Kashmiri Pandits and non- Kashmiri Pandit Hindus, who were driven out of the Kashmir province by the Jehad launched by Pakistani Jehadi-war groups operating from that State, the militant regimes and the Muslim separatist forces in Kashmir and the Hindus and Sikhs refugees driven out of the border areas of Jammu province from time to time, besides the Hindus of the Muslim majority areas of Jammu province driven out of their homes and hearths by the Jehad , as it spread into Jammu province in 1990, and after. The Kashmir dispute also revolves round the territories of the Jammu and Kashmir State, which are under the occupation of Pakistan. They comprise of the parts of the province of Kashmir and the province of Jammu and the Gilgit- Baltistan regions of the frontier divisions of Ladhakh along with the Dardic Dependencies of the State, Hunza, Nagar, Punial, Yasin, Ishkoman, Darel and Koh Gizir, which formed the part of the Jammu and Kashmir State and which constituted the strategic outer flanks of the western horn of the northern frontier of the State and the northern most outposts of the British Empire in India. The occupied territories are an integral part of the Indian state of Jammu and Kashmir, which were invaded by Pakistan against all tenets of international law as reported by the United Nations Commission for India and Pakistan, and accepted by the Security Council. The Security Council resolution envisaged the evacuation of the occupation forces from the occupied territories before the bulk of the Indian forces would begin to withdraw. The restoration of the administrative control of the occupied territories to the State Government was a precedent condition for the induction of the United Nations Plebiscite Administration into the State. The claim, that the bulk of Indian forces were to commence evacuation when the occupation forces were nearing the completion of their evacuation, virtually suggesting that the evacuation of the occupation forces was proposed to be concurrent, is a gross distortion of facts. The United Nations documents and the Indian correspondence in regard to them are unambiguous and clear, leaving no room for such misinterpretation that many in India including the author of ‘Kashmir Dispute’, have attempted mainly to prove that India was on the wrong foot. Pakistan and the Western powers dragged the Kashmir issue into Cold War, because the western powers needed to turn Gilgit-Baltistan into an advance military post, in their policy of the containment of the communist influence in Asia, and Pakistan sought to turn the United Nations intervention in Jammu and Kashmir into an instrument to destabilize the part of the State on the Indian side of the cease-fire line, to put India on a defensive and consolidate its hold over the territories under its occupation. In fact Britain and its allies in the Security Council shifted their basic stand to push India to accept the induction of a Plebiscite Administration while the invading forces remained in the occupied territories along with the Muslim militia of thirty thousand men raised in the occupied territories by Pakistan there. The Indian leaders were persuaded to allow Pakistan retain a part of its forces, about one third of the forces that India retained in the State. The agreement fell through because the United Nations military mediators tampered with the figures of the quantum of troops to be retained by the two armies in the State, forcing India to stall the agreement and the fiasco came to be known as the notorious “Delvoi Affair”. Neither Pakistan, nor the British and their allies were interested in an impartial plebiscite in the State. They were interested in enabling Pakistan to swallow the occupied territories and then use them as a spring- board to dislodge India from the rest of the State, establishing their hold on the Shivalik plains west of river Ravi. In the post war configuration of power in Asia, the whole stretch of Kashmir valley, the rugged mountain fastnesses of the Pahar and Jhupal regions of the Jammu province and the Shivalik plains stretching to the west of the river Ravi had assumed the strategic importance, they had never acquired earlier, even in the days of the Great Game. For India, Jammu and Kashmir was central to the defence of its northern frontiers and its strategic interests in the Sanskrit Himalayas. The stand taken by the British and their allies in the Political Committee of the United Nations General Assembly in the debate on Tibetan complaint against the Chinese aggression delivered a severe blow to the outlook of the Indian leaders about Asian solidarity. Nehru ducked for some time under the shield of Panchsheel. But he learnt a bitter lesson when the Chinese repudiated the McMahon Line. In the post Cold War balance of World power, India cannot go the way A. G Noorani apparently suggests. All demands for separate freedom, for whoever they are made, conflict with the unity of India. It must be understood by everybody in India, whatever, the station he has in the Indian political class, that the British divided India at the bidding of Muslim League, to create a Muslim power on the subcontinent to safeguard their own interests in and around India. The Indian people, the people of British India as well as the people of Indian princely States, were not the retainers of the British colonial rule in India. They had fought for a united India and its independence. How should they have allowed the Balkanization of the rest of British India and the Indian States, which were geographically contiguous with India and which were placed outside the territories earmarked for Pakistan? In fact, the League leaders had lost little time to smother into submission all the princely States within its territories, some of them including the State of Kalat, against the wishes of their rulers as well as their people. Why should the Indian people have allowed Pakistan to grab Jammu and Kashmir, which would have demolished the entire northern frontier of India? The Indian princely States were placed outside the partition of India and virtually detached from British India by the lapse of British Paramountcy, which like the partition of India was foisted upon the people of the Indian States by the Muslim League and the British against their will and against the remonstrations of the Congress leaders. The partition of India did not, even remotely, create any prior right for Pakistan to claim the State of Jammu and Kashmir, on the basis of the Muslim majority composition of its population. The Muslim League leaders, even when they were still in India or had left India, could not question the right of the Indian people to unite the remaining parts of the British India and the Indian States within its territories and contiguous with the Indian borders, to undo the wrong done to them by the Muslims and the British by foisting the partition on them against their will. They had turned down the entreaties of the Congress leadership and the leadership of All India States People’s Conference, to recognize the right of the people of the States to determine their future. Noorani notes right at the outset in his book, “A plebiscite in Kashmir was a moral imperative, besides being a democratic imperative.” This has been the position of many Kashmir experts in India who have tirelessly tried to influence the opinion of Government of India by putting forward this assertion. If the plebiscite was a moral imperative and a democratic necessity in Kashmir, was it not a moral imperative and a democratic necessity in not forcing the partition on the people of the British India? Was a plebiscite in the princely States not a moral imperative and a democratic necessity, when the lapse of the Paramountcy was imposed upon the people living in the princely States? Was a plebiscite not a moral imperative and a democratic necessity to determine the future disposition of all the States? Pakistan was not created in accordance with any moral imperative and its creation was not a democratic necessity. And if Pakistan would not have been created, the people of the five hundred and sixty-two States, including, not only Jammu and Kashmir, but Hyderabad and Junagadh would have united with India and repudiated the princely rule. The partition of India was a political maneuver in which the Muslim League and the British were partners and which was intended to Balkanize India and reduce it to a geographical expression. In fact for the Indian people, it was a moral imperative and democratic necessity to unite, whatever was left of India after the partition, without any consideration of whether any use of forces was involved. They had to defeat the designs of the Muslim League as well as the British. Had they faltered, they would have been defeated instead. Jammu and Kashmir was crucial to their efforts to recreate a united India. The author of ‘Kashmir Dispute’ has rightly pointed out, “Truth to tell, India and Pakistan launched a cold war even while they were in the embryo of history.” The bitter truth is that Pakistan launched an offensive right from the time the partition plan was accepted to Balkanize India and recommence the process of a second partition of India by seeking to support Muslim separatism in Jammu and Kashmir. The partition of India was the greatest betrayal of the Indian people by the British and the Muslim League. The British had ruled India for more than a century and when they decided to quit India, after the Second World War, out of their own compulsions, they divided India in collusion with the Muslim League. The Kashmir dispute is a legacy of the partition of India. The Kashmir dispute does not have its origin in the Treaty of Amritsar, with which many Kashmir experts including Noorani have tried to link it, without any historical justification. The Treaty of Amritsar was a fall out of the defeat of the Sikhs in the first Anglo-Sikh War, fought in 1846, which the East India Company imposed upon Sikhs to dismember the Sikh Empire and in which Gulab Singh played a role, to save the territories of the Sikh State to be annexed by the British. The British finally succeeded in doing so, after the Second Anglo-Sikh War, fought in 1848. The British offered the territories of the Sikh State- the province of Kashmir, Jammu, Ladhakh and Hazara to Gulab Singh provided he paid the indemnity, the British imposed on the Sikh State, on behalf of the Sikhs. Gulab Singh made good the indemnity on behalf of the State to save the Sikh territories from being annexed by the British, in consequence of which the Treaty of Amritsar was signed between him and the British, in continuation of the earlier treaty, The Treaty of Lahore, concluded between the British and the Sikhs. The Kashmir dispute is a part of the territorial claims, the Muslim League made for the separate Muslim homeland of Pakistan which the Muslims in India sought to achieve to ensure them a separate freedom. The Treaty of Amritsar could never be linked with the Muslim demand for Pakistan. The Muslim League claimed the part of British India which was inhabited by a majority of the Muslims for the separate homeland of Pakistan where they were assured the separate freedom they yearned for. The Muslim League claimed the Muslim majority princely States as well as the Muslim ruled princely States for Pakistan on the same religious principle, which they had used as the anchor of their demand for the inclusion of Muslim majority provinces of the British India in the Muslim homeland of Pakistan. The Kashmir dispute underlines the same religious principle, the claim to a separate freedom in which the Muslims of Kashmir are ensured the realization of their Islamic destiny. The assumption that the partition of India was a legitimate process of the transfer of power in India is an attempt to re-write history. Beginning the narrative on Kashmir from a disconnect, which deliberately presumes separation of the problem of Junagadh, Hyderabad and Jammu and Kashmir, from the division of India, that broke up the unity of a nation and a people, which had fought for freedom of their country for half a century. Such an assumption, without accepting it expressly, underlines the British belief that India was only a geographical expression and not a nation. Noorani writes, “Truth to tell, India and Pakistan launched a cold war even when they were in the embryo of history. Restless to cease power, each leadership was out to do the other down. In the three cases of disputed accession, Junagadh, Hyderabad and Jammu and Kashmir, each side adopted inconsistent stands on (1) the relevance of the instrument of accession ;( 2) plebiscite; (3) territorial integrity or the geographical factor; and (4) the religious factor. Both practiced deception. Both used armed forces as an instrument of policy.”Not a cold war alone, it was a struggle for survival, which commenced for the Indian people, when the Muslim League and the British foisted the lapse of Paramountcy on them. The Indian people were faced with the frightening prospect of the Balkanization of India with the reversion of the powers of the Paramountcy and the powers to determine the future of the States to their rulers, among them the Muslim rulers, whose States were spread across the length and breadth of India and who were dead set against the unification of their States with India. Actually the cold war between the Muslim League and the Congress leadership had a longer history. The Congress leaders out of their sheer self-righteousness, misread the demand the Muslim League made for a separate freedom, as a part of British strategy to contain the national movement in India. They even went to the extent of offering to the Muslim League to accommodate separate freedom for the Muslims in India and went as far as to accept the Cabinet Mission Plan- a contrivance which could have never kept India united. The Congress leaders did not realize that the Muslim demand for a separate freedom was the expression of an obscure commitment to reclaim a separate sphere of power in India if and when British left India. Mohammed Ali Jinnah and the other Muslim League leaders cooperated with the Congress leadership only so long, the Congress leadership professed loyalty to the British Empire and constitutional reform within the broad structure of the British colonial authority. It has been already clarified above that the Muslim leadership drew away from the national movement in India, as the Indian national movement drew closer to the demand for independence of India from the British rule and finally gave a call for separate homeland constituted of the territories of the Indian empire which were either populated by the Muslim majorities or ruled by the Muslims in India of the princely States. The demand for a separate freedom outside an Independent India underlined the Pakistan Resolution adopted by the All India Muslim League in 1940. The Pakistan Resolution formed the basis on which India was divided and the Muslim power of Pakistan created on the Indian soil. The transfer of power underlined the division of the entire British Empire into two successor States: the Indian Dominion and the Dominion of Pakistan. The Dominion of Pakistan was created of the Muslim majority provinces or the Muslim majority parts of the Muslim majority provinces and the Sylhet Division of the Hindu majority province of Assam. The princely States which spread over one-third of the territory of India and constituted one-fourth of the population of the Indian people were left out of the partition plan to be integrated with either of the two Dominions. Presumably, the States which were situated within the territories of Pakistan were expected to join the state of Pakistan and the remaining States, which spread across the rest of India including Jammu and Kashmir, which were contiguous to the borders of India, were expected to be integrated with India. That was exactly the spirit of the agreement on the partition of India, arrived at Simla, among the British, the Indian leaders and the leaders of the Muslim League. In fact Nehru and the other Congress leaders, who expressed serious misgivings about the lapse of the Paramountcy and the reversion of the powers the Paramountcy to the rulers vesting in them the power to determine the future disposition of their States in respect of their accession, were given assurances by the British that the Indian leaders would be free to unite the rest of India—the British Indian Provinces and the princely States into one indivisible Union of India. Evidently, the British gave assurances to the Congress leaders to force the partition of India down their throats. However, after the June 3 Declaration of 1947, the Muslim League leaders lost little time to smother into submission the princely States situated within the territories of Pakistan with the support of the British, and no sooner had they completed that task they turned to claim the Muslim majority princely States as well as the Muslim ruled princely States, situated all over the territories of India, for the Muslim homeland of Pakistan. As the plan of Muslim League, surreptitiously supported by a section of the British leadership at home and the British officials in whose hands, the reins of Indian Government were, unfolded, the Congress leaders and the people of India realized that after their defeat in consequence of which they had accepted the partition of India, they were face to face with another defeat: a major offensive mounted by the Muslim League of which the objective was to create territorial pockets of the Muslim power of Pakistan all over India interspersed within its provinces and the States which acceded to it. While the Indian leaders grappled desperately with the problem of integration with Mountbatten laughing in his sleeves, the people of the Indian States, whom the British as well as the Muslim League leaders had left of their reckoning , rose to the occasion and drove their rulers , mainly those who were more recalcitrant among them, to join India. The Muslim League had insisted upon the lapse of Paramountcy and stubbornly refused to accept the right of the peoples of the princely States to determine their future disposition in respect of their accession to either of the two Dominions in pursuance of the plan to use the Muslim ruled States, of which a large number was spread across India, to Balkanize the whole country, and establish territorial pockets of Pakistan everywhere on the sub-continent. Pakistan invaded Jammu and Kashmir, occupied nearly half of the State and was pressing to annex the remaining part of it, and then deal with Junagadh and Hyderabad from a position of strength. In both the States: Junagadh and Hyderabad, the people were in a state of revolt against their rulers: in Junagadh for the decision of their ruler to accede to Pakistan and in Hyderabad for the intransigence of their ruler and his efforts to remain out of India and align his State with Pakistan against their wishes. In circumstances, where British and the Muslim League spared no efforts to break up the unity of India and in which the Indian people were fighting with their back to the wall to retrieve Junagadh and Hyderabad to keep the South and West of India united and struggling to save Jammu and Kashmir from being swallowed by Pakistan, to protect their frontier in the north, the only moral imperative and democratic necessity was to keep India united and defeat the designs of Muslim League and the British , who sought to impose a plebiscite in Jammu and Kashmir on the terms laid down by Pakistan and not in accordance with the United Nations resolutions on Kashmir. The alternative proposals made by the British and their allies in the Security Council, which virtually proposed the holding of a plebiscite while half of the State remained under the occupation of invading forces of Pakistan, including the McNaughtan proposals and the Dixon Plan, were a prescription to handover the State to Pakistan on a platter. Noorani, intriguingly, does not mention anything about what the United Nations Commission for India and Pakistan, did behind the scenes, in the State, in sheer transgression of its terms of reference. The author does not question the necessity of revising the original proposals envisaged for the withdrawal of the invading army of Pakistan. Nor does he explain the reasons for the United Nations Commission for India and Pakistan to propose “a modification in the original plan of demilitarization.” The author makes no comment on the recommendations that, “the problem of demilitarization should be treated as a whole, eliminating all distinctions, and comprising questions concerning the final disposal of all armed forces in the State of Jammu and Kashmir.” No government of India could have accepted the British and the American proposals to throw out the Indian troops from Jammu and Kashmir, allowed the State government to be set aside, and hand over the State to them to decide its fate in a way, which suited their strategic interests in the new bipolar balance of power in the post war world. Why should Nehru have agreed to accept the McNaughton proposals and Dixon Plan, which virtually underlined the repudiation of the agreement envisaged by the United Nations resolutions on the demilitarization in Jammu and Kashmir and seek the withdrawal of the Indian Army from the State, dissolution of the State Government and a division of the State as suited their interests in Asia? Nehru was saved by his intuition or intelligence he must have received, which he kept to himself alone, about the role the British were surreptitiously preparing to play in respect of the Chinese preparations to annex Tibet and expose the Himalayas, more specifically the Sanskrit Himalayas, to hitherto unknown pressures. Mc Naughton proposals, Dixon Plan, and the Graham’s twelve point scheme, were all aimed to neutralize the Indian position in the State. The government of India had by this time learnt enough of how to safeguard its vital interests and was able to see through the proposals which the United Nations mediators made. In 1958, Graham was deputed again to resume his mediatory efforts to bring about an agreement on the implementation of the demilitarization of the State. Graham drew up a four point formulation, which in essence underlined the stationing of the United Nations troops in the occupied territories of the State after the invading forces were withdrawn from there. The government of India rejected the Graham’s proposals outright. The process of the division of India came to its end with the British withdrawal from India. The Muslim League leaders as well as the British themselves, realized to their chagrin, that with whatever leverage the British and their allies had in the Security Council, they could not influence the events in India. The rendition of Junagadh and Hyderabad followed as a matter of course subsequent to the transfer of power in India. A plebiscite in Jammu and Kashmir was never a “moral imperative” and a “democratic necessity” for India. For the Indian policy in respect of Kashmir, strategic considerations were a political necessity which no government of India could overlook. It has been already noted that the people of the Indian States, whom the Muslim League as well as the British had left out of their reckoning, played the central role in defeating the designs of the Muslim League to use the princely States to break up India further. Had the people of the States not fought their way to unite the States, particularly those whose rulers were opposed to the unification of their States with India, among them rulers of Junagadh and Hyderabad, the Indian Army would not have been able to intervene to retrieve them. In Jammu and Kashmir as well, the Hindus , Sikhs, Buddhists and the Muslims, who supported the National Conference and who fought shoulder to shoulder with the State army which kept the invading hordes at bay and earned a long reprieve of five days, for the Indian Army to be able to reach Srinagar and beat back the invasion. The questions raised by Noorani in his study: “Did Sheikh Abdullah indeed wish to accede to India? How strong were his representative credentials on the accession? What was the people’s reaction to the accession to India, once the immediate menace of the tribal raid was over?” are sheer clichés to twist the history of those fateful days. Noorani must not be unaware of the meeting between Meher Chand Mahajan, the Prime Minister of Hari Singh, whom the Maharaja had sent to Nehru with the offer of the accession of his State to India, while the State army was fighting the last ditch battle to hold the advance of invading army on the Jhelum Valley road. Sheikh Mohammed Abdullah, who was present there, nudged Nehru asking him not to waste any more time in unnecessary argument with Mahajan and accept the Maharaja’s request and send the Indian troops without any delay to save the State. Sheikh Mohammad Abdullah knew what he was urging Nehru to do. Not being a witness to what happened in Kashmir those days, the author would have done himself good to have read the account of the National Conference leaders or met them in order ascertain the support Abdullah received not only from the Hindus, Sikhs and Buddhists in the State, but the Muslims of Kashmir as well. Noorani’s book underlines the inevitability of the partition as a historical necessity because the Muslims in India demanded a separate freedom for themselves on the basis of their territorial claim to that part of India where they formed a majority. The study also underlines the inevitability of the accession of Jammu and Kashmir to Pakistan on the same basis that it was a Muslim majority princely State and therefore rightfully belonged to Pakistan. The Hindus and other non-Muslim communities in India had not claimed freedom from the British rule on the basis of their demographic composition. They had claimed the freedom for India, on the basis that India was an indivisible unity, which had a right to freedom from the British colonial rule. The division of India, imposed upon them by the Muslim League, in collusion with the British, to secure the Muslims of India, who formed a small fraction of the population of India, a separate freedom, which was different from the freedom they had fought for, was an irreparable wrong done to them. The territorial claim the Muslim League made on the basis of the Muslim majority composition of the British Indian provinces and the Muslim majority States or the Muslim ruled States, was fictitious claim, original to the Muslims of India, a distortion of history. The allegation that wrong was done to the Muslims of Jammu and Kashmir, for not recognizing their separate freedom, is also a distortion of history and a part of the fictitious claim to a separate freedom, which formed the basis of the foundations of Pakistan. The argument which pervades the whole length of the author’s study was then, as it is now, inconsistent with the way, the partition of India was foisted on the Indian people and the insistence of the Muslim League on the lapse of Paramountcy, which the British supported in their own interests. The author is, however, unable to come out of the time- warp in which the Muslim homeland of Pakistan was not able to assume the territorial proportions, Mohammed Ali Jinnah and the Muslim League envisioned for it. Noorani notes in his study: “Myths were spawned and still persist. Few know that it was India which invoked the religious factor in a formal proposal on Novemeber1, 1947, and spoke stridently of the religious principle underlying the partition. India’s pain at the dismemberment of its territorial integrity was justified. But that very factor justified Pakistan’s pain at Kashmir’s accession to India, which only Cyril Radcliff’s controversial award of Gurdaspur in August 1947, made possible. Genuinely or otherwise Mountbatten rued the award later in his talks with Dominique Lapierrie and Larry Collins. The road and river communications were with Pakistan exclusively.” The content of the quote from the author’s study formed the main burden of the Pakistan’s propaganda broadcast from its radio network in Pakistan as well as the “Azad Kashmir Radio” from Muzaffarabad in the occupied territories those days in 1947, which followed the accession of Jammu and Kashmir to India. Obviously, except propaganda and perpetration of falsehood, who in India and Pakistan believed then or would believe now, that the religious criterion for the transfer of power in India, was not made on the foundation of the demand for a separate homeland of Pakistan, or the inclusion of the Muslim majority princely States, as well Muslim ruled princely States in its territories. Noorani and all those who advocate concessions to Pakistan in Jammu and Kashmir to settle the issue are not aware of the whole context of the religious factor being brought in the discussion on the accession of the States or have deliberately tried to hide the ugly truth behind it. They, perhaps, do not know that Mountbatten was no votary of the unity of the princely States with India and immediately after the 3 June declaration of 1947, he conveyed to the princes that those among them, who wanted to continue their existing relations with the British Crown, could convey to him their requests to continue their relations with the British and he would forward them for consideration of the Home Government. After the British Government made it clear that they would not recognize either independence of the Princely states or accord them a Dominion Status, he lost no time to pay a visit Kashmir to persuade Hari Singh to come to terms with Pakistan. A bewildered Maharaja, who collected himself sooner than Mountbatten thought he would, sent the Viceroy to the Indian capital empty handed. The British and their Crown Representative in India were interested in including Jammu and Kashmir in the Muslim homeland of Pakistan, to protect their own interests in Asia and for the protection of the sea routes across the Indian Ocean from the Gulf to the Malacca Straits. It was with the interests of his country in view, that Mountbatten proposed the settlement of the States on the basis of their demographic composition A section of the Congress leadership approved of his proposals, reluctantly though, out of the fear, which the activities of the Muslim princes and the unscrupulous dealings of the British officials, including the British Resident officers posted in the princely States as well as the State Department and its chief Conrad Cornfield, created. Mountbatten made a public announcement of his proposals, when in his last address to the Chamber of Princes, he urged upon them to accede to the either of the dominions on the basis of the geographical position of their States as well as the composition of their population. Jammu and Kashmir did not form a part of the north-western India as Noorani want readers of his study to believe. It formed a part of the north of India and its borders in the north-west and north were rimmed by Afghanistan, Chinese Sinkiang and in the north-east and east by Tibet and India in the south-east and south. 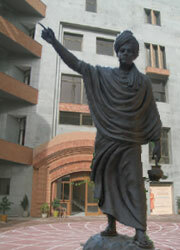 Controversy over the Radcliffe Award was sheer propaganda made by Pakistan, and did not form a part of the discussions in the Boundary Commission of the Punjab, which was constituted of Justice Din Mohammad and Justice Mohammad Munir, representing the Muslims of the Punjab and Justice Meher Chand Mahajan and Justice Teja Singh representing the Hindus and Sikhs of the Punjab respectively, and Sir Radcliffe, who was its Chairman. Radcliffe was an Englishman who was independent in his outlook and enjoyed great reputation in England, and looked straight at his task and to the chagrin the Muslim League leaders, did not listen to their remonstrations as the friends of the British Empire in India. The discussion in the Commission and the Award Radcliffe made, show that all the members of the Commission knew of the actualities of the borders of Jammu and Kashmir and their contiguity to India and Pakistan. In fact, Din Mohammad and Muhammad Munir, unmatched in their intelligence and understanding, told Mahajan and Teja Singh, when they made a mention of keeping the road link between Jammu and Kashmir and Madhopur and Pathankot Tehsils of the Gurdaspur district open, that Jammu and Kashmir could build a road which would connect Kathua, on the Jammu Madhopur road, directly with the nearest of the Punjab Hill States, which had acceded to India. The Tehsil of Pathankot could not by any means be included in the West Punjab because it was predominantly a Hindu majority Tehsil, and the Punjab Boundary Commission had not followed district boundaries as a basis of the demarcation of the boundary line between the East and the West Punjab and at many places it cut through the district boundaries. Radcliff was conscious of the security of the district of Amritsar, which could not go to West Punjab as well as the laying down of the defensible border between the two countries. He gave contiguous Tehsils of the district of Gurdaspur to East Punjab, leaving out the Tehsil of Shakargarh for the West Punjab. Maharaja Hari Singh, the author has admitted, played his part to thwart the efforts of the Muslim League leaders to deprive him of access to Madhopur in Pathankot. He made no mistake to read the intention of the League leaders to choke him and his State by closing all communication lines, which connected his State with India and ran into the West Punjab. The Jhelum Valley Road, which the author notes was the only channel of communication between the State with the outside world is not correct. As already noted in the first paper, there was a railway line which connected Jammu and Sialkot with a tarmac road running alongside from Sialkot to Jammu. Both ran into Pakistan. The impression the author seeks to create and quotes Mountbatten’s interview in support of his contention that Radcliff Award had given access to otherwise land locked State, is a travesty of actual facts. Jammu and Kashmir had a long border with the Punjab hill States and a communication line could be built without much difficulty which would connect the State with India. How does Mountbatten’s comment of Radcliff Award add weight to the author’s argument? Who of the British officers in India, including the Governors of the Punjab and the North-West Frontier Province, besides Mountbatten, were not angry with both Radcliff as well as Hari Singh? The historical forces which compelled the British to leave India, were bound to take their own course and the people of the princely States determined their direction. Noorani begins his narrative with lamentation which reflects the commitment of the Muslims of Kashmir for a separate freedom that they have been struggling for the last six decades. The author notes, “ If fifty seven years later the soul of Kashmir is in torment and cry for azadi, it is because despite the profuse professions and pledges, Nehru cared little for, still less Mohammed Ali Jinnah and the last of all the British. The people have been in revolt, pelting stones rather than bullets. Nobody alleges Pakistan’s aid and complicity. The harsh truth is that which Nehru and his successors, as well as Indian media and academia, suppressed for long, is now out in the open.”The author is very plaintively, repeating the claim, Mohammad Ali Jinnah and the Muslim League leaders made in 1947, that the Muslim majority parts of India, formed a part of the Muslim homeland of Pakistan and should be recognized so. Nearly half of the State is already a part of Pakistan. The Gilgit- Baltistan division of the Ladakh Frontier is now an integral province of Pakistan. The rest of the occupied part of the State is also a part of the Islamic Republic of Pakistan though it has a separate constitution. The Constitution of ‘Azad Kashmir’ says that “no law shall be repugnant to the teaching and requirements of Islam as set out in Quran and Sunnah.” The Constitution further provides that one-third of the total members of the Legislative Assembly of the State can refer for advice, questions of doubt, in respect of any issue to the “Council of Islamic Ideology constituted under the Constitution of the Islamic Republic of Pakistan.” For the author, though he very deftly refuses to admit, without expressly denying it, the occupied territories of the State have joined the Muslim homeland of Pakistan in accordance with the claims of Muslim League laid to Jammu and Kashmir on the basis of the Muslim majority composition of the population of the State. The Kashmir dispute, the author seeks to convey to the Indian people, is now reduced to the liberation of the part of the State on the Indian side of the Line of Control, from the Indian occupation. Like Mohammad Ali Jinnah and Muslim league leaders, the author’s concern is to ensure separate freedom to the Muslims of Jammu and Kashmir, which enables them to realize their Islamic destiny. The hurt he feels finds expression in his rhetoric about the denial of the freedom, which the Muslims in Kashmir aspired for. He writes in the concluding part of the first volume of his study, “the people are not bereft of souls. They have aspirations, feelings and memories of wrongs. 2012 is not 1986. It takes about a small incident that hurts the people’s feelings and revives memories of wrongs to set Kashmir aflame. It happened in 2009 and 2010 and can happen any time. Only a political settlement will satisfy the people.” The author identifies the people of the State with Muslims. So do the entire brand of peaceniks and a section of Indian political class identify the people of the state with merely Muslims. Four million of the ten million people living in Jammu and Kashmir on the Indian side of the Line of Control are Hindus, Sikhs and Buddhists. They have, as sacrosanct a right on every inch of their land, as the six million Muslims have. They are also not “bereft of souls”, they also have aspirations, feelings and memories of wrongs. They have been living in the enslavement of a situation created by Pakistan and those who seek freedom for Jammu and Kashmir from “the Indian occupation”. However, they are not a concern of the author, because they do not support the freedom of the State from India. The author’s main concern is to seek the freedom of the Muslims of Kashmir from India, which would open the way for the Muslim power of Pakistan to reach Shivalik plains, situated to the west of the river Ravi in the south and the Sanskrit Himalayas in the north. Mohammad Ali Jinnah asked for the division of the British India to carve out the Muslim power of Pakistan. After he had secured the division of the British India, he foisted the lapse of Paramountcy on the Indian people to find a way to unite Jammu and Kashmir with Pakistan and break up the Indian princely States to spread Muslim power all over India in territorial pockets, the Muslim ruled States waited for. Jinnah had to contend with the people of the States and their aspirations for freedom in a United India for which they had fought for half a century. He failed in spite of the support he received from the British to divide India further. To force the freedom of the “Muslim Kashmir” on the people of India, Pakistan, the Muslim separatist flanks in Kashmir and whosoever supports them, will have to contend with the Hindus, Sikhs and the Buddhists of the State along with the Muslims who stand by them. They cannot be deprived of their freedom, on the ground that the Muslims form a majority of the population of the State on the Indian side of Line of Control. The freedom that the author alleges the Muslims of the State have been denied by India is not the freedom, which nations of the world have fought for: freedom from oppression and exploitation, and discrimination on the basis of religion, right to liberty and freedom, right to freedom of faith and right to protection against persecution. Pakistan, the Muslim Separatist forces and the Jehadi war groups, which have been waging a religious war in the State during last two decades, are seeking a “separate freedom” for the Muslims of the State. The freedom which the author has vexed so eloquently about in his study, is “the separate freedom” which formed the basis of the division of India—the “separate freedom” which lead to the creation of the Islamic Republic of Pakistan and the “separate freedom” which is aimed to ensure unification of the part of the Jammu and Kashmir state on the Indian side of the Line of Control with Pakistan. The freedom, the Muslim separatist flanks in the State are fighting for, has nothing local emanating from the soil of Jammu and Kashmir: Muslims, Hindus, Sikhs and the Buddhists aspired for and fought for, shoulder to shoulder with the people of India against the princely rule as well as the British Paramountcy.